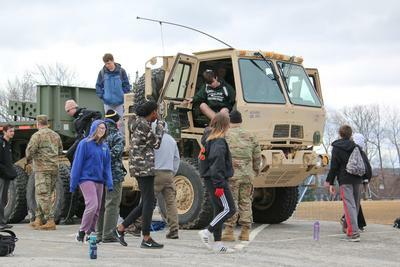 Students in high school junior military programs learn about military vehicles as part of Maine Maritime Academy’s annual NROTC Challenge over the weekend. High school students in Navy Junior Reserve Officers Training Corps (NJROTC) and other junior military programs around Maine and New Hampshire were on the Maine Maritime Academy campus to take part in the school’s annual NJROTC Leadership Challenge. Over the course of the weekend, 107 students got a taste of military life and training. Under the command of academy students ranking in the regimental program, they bunked on the T/S State of Maine, took part in pool trainings and wet/diesel lab work, participated in drill competitions, and received training in the importance of hygiene, tidiness and the ability to adhere to authority figures while being in the military. The weekend-long event started in 2006 and ran for two years before it was discontinued. It was picked up again in 2015, and has been running ever since. Eric Moulton, who heads the NJROTC program from Nokomis High School, has been bringing his students for several years, and he said that the experiences they have are beneficial in a number of ways. “A lot of the kids have been here before, and while they keep coming back, [the academy] keeps things different in the sessions that they participate in. It’s really great experience, and it’s different from what we do with them throughout the school year,” said Moulton. MMA senior Makayla Lewis was one of the regimental students tasked with being a commanding officer over the weekend. In charge of the ship, Lewis made sure the students were orderly and got to where they needed to be. The students spent two overnights on campus before heading back to their respective schools on Sunday. 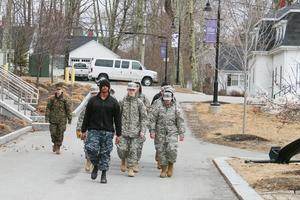 Students in high school junior military programs participate in a march from the T/S State of Maine to the dining hall on the Maine Maritime Academy campus. 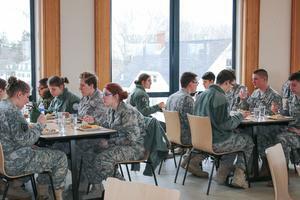 Under the direction of Maine Maritime Academy students, high school students are instructed to find their seats and eat lunch during the academy’s annual event for high school junior military programs.